When you’re driving your car, there are a few noises that you don’t want to hear coming from your brakes. If you hear any of these sounds, then you should consider getting Road Runner Auto Care in Apple Valley to examine the brake system to see if there are any problems with the brake pads, rotors or other components. The brake light usually doesn’t come on in the car unless the fluid is low or the parking brake is engaged. If you release the brake and the light is still on, then you need to get the car checked by someone like Road Runner Auto Care in Apple Valley. A qualified mechanic can check the fluid and the brake lines on the car to see if there are any leaks that would cause the light to come on or if there might be an issue with the electrical aspects of the brake system. 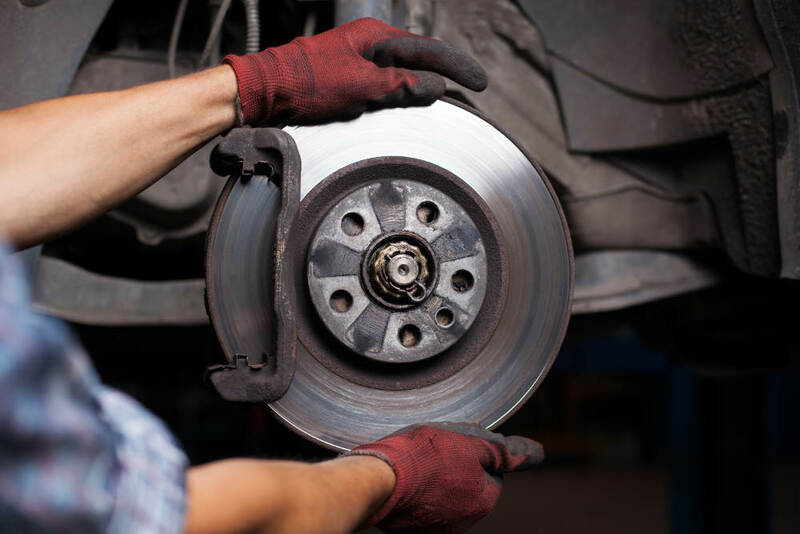 Anytime you hear squealing or grinding when you depress the brake pedal, it’s usually a sign that the brake pads need to be replaced of the rotors need to be turned. Don’t wait until the brake pad goes to the floor when you depress it because you might not get stopped in time. A high-pitched squeal is usually related to the pads while grinding is usually related to the rotors. 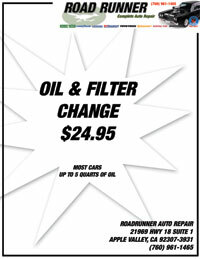 Road Runner Auto Care can change the pads and turn the rotors instead of replacing them if you take your car to get checked as soon as you hear these sounds. A vibration could be an indication of a flat tire or a tire that is out of balance. It could also be an indication of your rotors being uneven, especially if you feel the vibration when you’re braking. It’s normal for the rotors to get a little dust on them which could cause a slight vibration. Turning them will help clear away some of the debris and allow for a smooth surface for your brake pads to rest on while braking.